I've been sitting on this recipe for a while, even though my family unanimously agrees they were the best thing to come out of the oven in 2014. It feels unfair to not start out the year by posting them, then, so you can get the best thing that will come out of your oven all year out of the way in the first few weeks. Less to worry and plan about and all that. 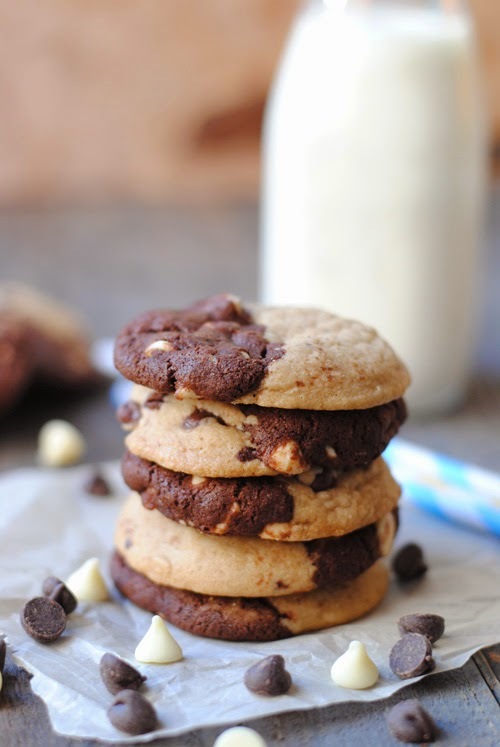 This may all sound ridiculous but these cookies are not your grandma's humble chocolate chip. A hybrid of chocolate chip and reverse chocolate chip cookies, the equally chewy, dense halves finally put an end to debates about what should be baked and for whom. You can munch on one side, both sides, or spilt them apart to share. They're a bit more work than your standard mix-and-drop chocolate chip cookie, but so good and so worth that little extra effort. 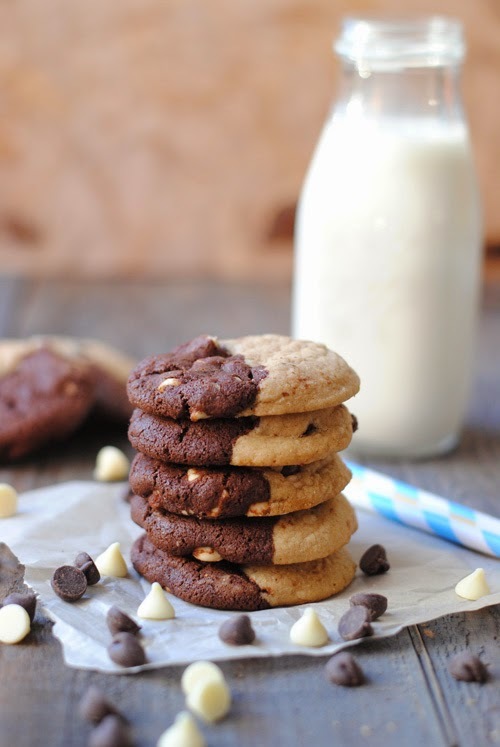 Start with the regular cookie half. Sift together the flour, baking soda and salt. Set aside. In the bowl of a stand mixer, cream together the butter and sugar until well blended. Beat in the vanilla, egg, and egg yolk until light and creamy. Mix in the dry ingredients until just blended. 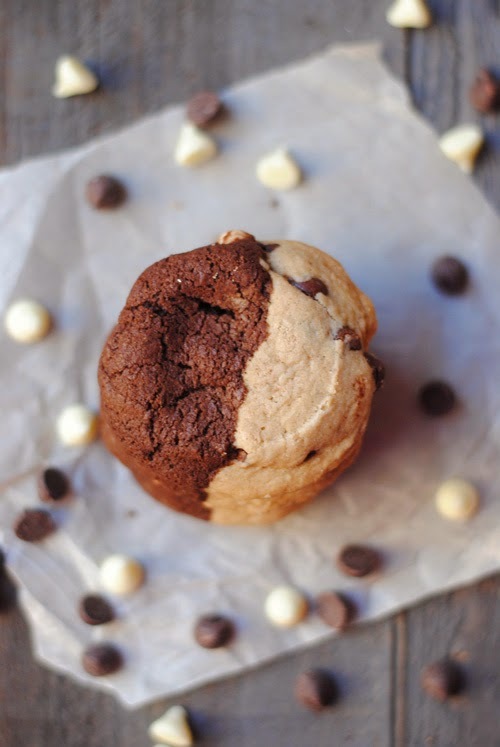 Fold in the chocolate chips, transfer to a bowl, and pop the dough in the fridge while you make the next batch. To make the reverse cookies, sift together the flour, cocoa powder, baking soda, and salt in a medium bowl and set aside. In the microwave, or a small heat-proof pan over simmering water, melt the butter and semi-sweet chocolate together until smooth. In the bowl of a stand mixer, whip together the chocolate mixture, eggs, sugar, and vanilla, until well combined. Add the remaining ingredients and mix until well blended. When ready to make the cookies, remove both doughs from the fridge. They should be firm but pliable (if too firm, just let warm up at room temperature for a few minutes). Use a 1 or 2 tablespoon cookie scoop to scoop one cookie from each dough batch. 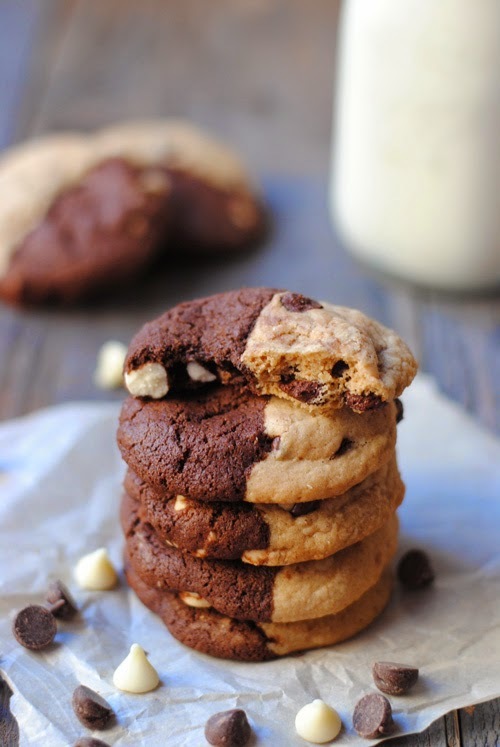 Cut each in half, then press together the two halves to form a hybrid cookie. Repeat for the remaining dough. To speed up this process, I would scoop a bunch from each batch at a time, cut them, then press them together. Bake at 325F for 13-15 minutes. Allow to cool a few minutes before removing to a wire rack.